ANALYTICAL IMAGES PROMOTE RELIGIOUS DISBELIEF, RESEARCHERS CLAIM. In a study published yesterday in the journal Science, researchers from Canada’s University of British Columbia posit that people who believe in God are not analytical thinkers. That’s a disingenuous way of saying people of faith are stupid. In other words, when religious people analyze their beliefs, they become less devout. They go from stupid to smart, like Norenzayan and fellow co-author Will Gervais. So how did the researchers test their hypothesis? They recruited 650 or so Canucks and Yanks to participate in their study. 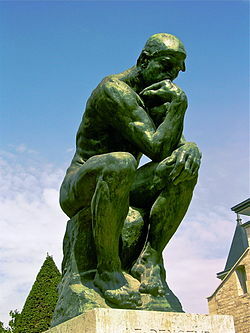 They showed some participants images of artwork that supposedly encouraged analytical thinking – like Rodin’s statue, “The Thinker.” Other participants were shown images that did not encourage such thinking. After viewing the images, researchers measured participants’ religious beliefs through a series of questions. The participants who viewed the images promoting analytical thinking were more likely to experience a decrease in religious belief, the researchers claimed. And that supposedly included devout believers. “There’s much more instability to religious belief than we recognize,” said Norenzayan. Apparently so, if a person of faith can look at a few pictures and suddenly lose his or her religion. As it turns out, there was less to the miraculous de-conversions than the researchers claimed in their study. Their experiment didn’t really turn devout believers into total atheists, Norenzayan fessed up. Yet, he maintained, if people routinely thought analytically, like scientific researchers do, there would be fewer people of faith. The study by Norenzayan and Gervais is nothing more than junk science. It is an insult to people of faith who are well-educated; who arrived at their religious beliefs by analytical thinking. And it reflects poorly on the judgment of editors at the journal Science. 28 Apr	This entry was published on April 28, 2012 at 8:28 AM. It’s filed under Science and tagged ARA NORENZAYAN, JOURNAL 'SCIENCE', RELIGIOUS BELIEF, research, STUDY. Bookmark the permalink. Follow any comments here with the RSS feed for this post. Why can not one think both analytical and intuitively? Yes, we are foolish to the world but I think we will be fine in the end! 1 Corinthians 1:18 For the message of the cross is foolishness to those who are perishing, but to us who are being saved it is the power of God. Now you’re just making stuff up. Well that all depends on how you define intelligence, it’s a very vague term to begin with. For example, the ability to solve abstract problems has been improving in some societies but their practical knowledge has decreased. Who is smarter, the one who can solve a thought problem about a tree or the one who can turn that tree into a cunning trap to catch dinner? Not being an analytical thinker isn’t the same as being stupid, you’re taking offence where none need be taken. Some people are analytical, others not in the same way some people are creatively minded and others not; or mathematically minded etc. People aren’t the same and just because some think in different ways doesn’t make them stupid. As for the study itself, it didn’t measure people as an absolte statement i.e. classifying people into atheist or theist. Instead it used a 100 point scale for certainty regarding the existence of a God. The average dropped from ~60% sure to ~40% sure after analytical tasks/looking at the thinker etc. You are oversimplyfing the study, I think. Can a person of devout religious faith suddenly transmogrify into a disbeliever after simply looking at images that supposedly encourage “analytical” thinking? That questionable finding by the Canadian researchers is indeed an offense to people who arrived at their faith not by mere “intuition,” but by thoughtful analysis. It’s unlikely looking at images would result in immediate abandoning of religion, but the study isn’t claiming that’s what happens. Just that looking at those images reduces the average certainty of God’s existence by ~20%. One of the important words in that sentence was “average.” There would still be outliers, individuals who weren’t that affected by the imagery or for whom analytical thinking was involved with their belief (and similarly there would people for whom intuition was involved with their disbelief). The offence you’re taking from this article seems to be in your head, arising from misunderstanding of the research. Once you understand that non-analytical doesn’t mean stupid and average doesn’t mean everyone your vitriol are rendered unfounded.